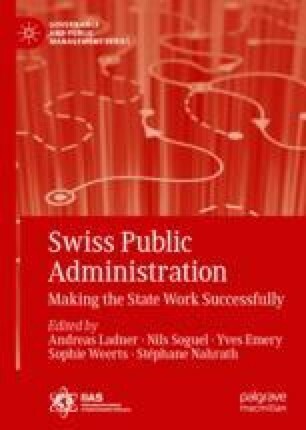 This chapter discusses how the provision of tasks and services is organized in Switzerland. Starting historically only with military expenditures and subsidies for cantonal projects, the federal level subsequently expanded into policies such as infrastructure and transportation projects, as well as guiding the expansion of the welfare state. More recently, federal decision-makers and administrators have engaged in economic and environmental policy-making. Subsidiarity and fiscal equivalence are the guiding principles when it comes to allocating tasks to the three levels of government. Nevertheless, there is a high degree of cooperation between these levels, as well as among the cantons and the communities, or between the state and the private sector. Increasing governmental responsibilities and the importance of the various actors in fulfilling tasks is mirrored in their finances and financing modes. This is all the more significant because each level in Switzerland has its own sources of income and must pay for its own expenditures. Halbeisen, P. (2010). Öffentlicher Haushalt. Historisches Lexikon der Schweiz. http://www.hls-dhs-dss.ch/textes/d/D26197.php. Accessed 7 May 2012. Meister, U., & Rühli, L. (2009). Kantone als Konzerne. Zürich: Avenir Suisse. https://www.avenir-suisse.ch/publication/kantone-als-konzerne/. Accessed 31 May 2018. Stalder, H. (2010). Öffentlicher Haushalt. Historisches Lexikon der Schweiz. http://www.hls-dhs-dss.ch/textes/d/D26197.php. Accessed 7 May 2012.